Blonde supports many hardware devices in order to have a faster, more secure and more comfortable usage. Using such hardware devices is not a primordial to use Blonde but they help you to create more synergies for your salon management. The products we recommend for Blonde are properly tested, are compatible with Blonde and are guaranteed to work with the software. If you wish to use a different hardware device with Blonde, please contact here our customer service support on compatibility issues. In this section you can find standalone devices and accessories. We created two Pack option for a more affordable price. These packs are also recommended if you already have a computer for Blonde. The MS9520 Voyager is perfect for many applications, including point-of-sale, inventory control, and commercial/warehouse applications. With its aggressive performance and comfortable design, Voyager is far and away, the most advanced scanner on the market today. Windows and Macintosh software and users guide on CD-ROM, printed Quick Start Guide. Cash drawer has a patented "Screwless" tamper-resistant design for added security. It also has a special feature that cushions drawer slams and protects the system. This compact drawer with high reliability and durability (MTBF 1 million open/close). The chassis and drawer have durable metal construction. 1 year return to base included in price. Password-based authentication is susceptible to hacking, spoofing and lax security practices. DigitalPersona solutions replace passwords with convenient fingerprint-based authentication assuring that only authorized users gain access to networks and applications. If you already have a computer and would like to spice up your reception you can choose this amazing and colourful pack. Call for colour options. Colourful Pack without the touch screen, at an unbelievable price. Pack include: Ody receipt printer, Ody cash drawer, Ody barcode scanner. 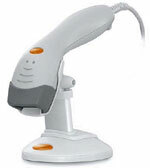 Barcode scanners facilitate all stock movements. Barcode scanners are mostly used to accelerate retail sales, but these are great instruments also for stock purchases and intra-stock movements. A receipt printer can be linked to your computer. It gets the input directly from Blonde, so you do not need a cash till to issue receipts. Additionally, you can also print on the receipts the date of the next appointment or spceial offers. We recommend Epson receipt printers. For the perfect POS solution we recommend using a cash drawer together with Blonde. Opening the cash drawer may be controlled by either Blonde or by a separate key. We recommend Posiflex type cash drawers. You can print labels for customers, products and bookings by the Dymo printer: customer card, booking reminder, customer postal address, product price card etc.